What To Do With That Canned Salmon Lurking In The Pantry? Canned Salmon. I grew up with it in landlocked Northwest Iowa in the 1960s. And I didn’t like it. There was a time I’d tell you that you were nuts that I’d buy it and use it. Let’s face it, though, if you’re on a limited budget and want to get some healthy fish in, if you want to save time, or if you want to make certain dishes, Canned Salmon can be the way to go! When I had to start consciously budgeting for food, my food snobbery (of course I “only liked” fresh Salmon) left me missing some essential nutrients. I had to learn a few tricks on how to work fish into my diet. One of the tricks not mentioned on that post? Be open to canned Tuna (on a limited basis; eat low on the food chain, especially where fish is concerned) and, be open to canned Salmon. First of all, Canned Salmon can be a bit of a shock when that can is opened! There’s no denying that. You’re talking about chunks of cooked salmon, usually with at least some of the skin and often small bones swimming in a murky liquid. And even though the salmon is actually pretty good, it’s going to be soft, maybe a little overcooked and definitely bland. On the plus side, if you know how to deal with it, know how to cook with it and when to use canned salmon you might be surprised at how good it can be. Just as importantly, know when not to use it! And canned salmon has the same nutritional profile of any freshly caught salmon out there. Bonus! Canned Salmon can come in different types, from different locations, and in different varieties. I try to stick with something that says “wild caught” which almost all canned salmon is, so I know it’s not farmed (and the fishing industry is stringently regulated) and I can avoid any concerns there. Read the labels, carefully, and avoid Atlantic Salmon, which is probably not wild caught and has nearly been fished to extinction, if you care about sustainability. Canned Salmon comes in various sizes. I generally buy the 14.75-ounce cans, which are the standard. It’s generally more expensive than the smaller cans because it’s larger, but usually, a better bargain, if the price per pound or price per ounce is compared. There are two times of the year that you’ll find canned salmon heavily discounted and on sale and maybe with coupons, too. The first is during Lent, and you might want to see my post on Easter & Lent, Leveraging the Sales. This is when the best sales happen. The second, when the sales are generally sporadic, not as good, is during Advent, the liturgical season leading up to Christmas. See my post on Winter Holidays for other items that will be on sale during that time period. With any item, even Canned Salmon, there will be other times it might go on sale, but rarely do those sale prices approach the discounts of the Lenten sales. Stock up during Lent, for the year, and do the same on any other canned fish or seafood if you use them. Be open to shopping around and be open to checking at your local pharmacies, a kind of surprise place to find great sale prices on both canned fish and honey! (This price is no longer active but here’s an example!) Usually, on canned fish, the discounted sale prices during Lent at your regular grocery or pharmacy are less than the prices at the dollar store, Aldi and your buyer’s club. For pantry items, it never hurts to follow your coupon matching sites, even if you don’t normally use coupons; they’ll alert you to sales. It never hurts, either, to check the discount bins, especially after Easter. How much cheaper is a can of Salmon compared to fresh? First of all, it depends on what you’re paying for each. Fresh Salmon, here, on a once in a blue moon sale during Lent or Advent, can drop down to $5.99 a pound, but most really excellent sales are between $6.99 and $7.99 a pound and regular sales $9.99 a pound. Fresh salmon will generally have skin and sometimes bones, so account for that in the pricing. A can of Salmon yields about 9 1/2 ounces. On a good sale, it’s usually about $1.99 a can, but I’ve picked it up during Lent for $1.00 a can and now and then, even less. At $1.00 a can, Salmon is the equivalent, after being cleaned of skin, bones, and water, of $1.68 a pound. At $1.99 a can, Salmon, again, after being cleaned of skin, bones, and water, is $3.35 a pound. So, if you’re on a budget and fresh, or even frozen, Salmon isn’t a consideration, canned Salmon is a budget-friendly option. It’s probably very worthwhile when you consider the health benefits of eating Salmon…at least it is for me. It’s a healthy protein item that compares very favorably, price wise, to other proteins we might consider to be “cheap” but don’t offer the positive health benefits: ground beef, for instance, or cheaper cuts of pork. Salmon Burgers – these are outstanding! All canned products are usually going to be stamped with some version of a “Best If Used By” date. These are dates chosen by the producer, with no oversight by any government agency, what-so-ever and is not an expiration date. It is a date the producer feels the product will be at peak quality and very well might be a very conservative date. Properly stored your canned salmon will be good for three to five years, and perhaps longer. At some point during longer storage, the quality may suffer, texture or color may change, but if properly stored, in most cases should be safe. If there is a bulging in a can, rust, dents, off-color, smell or any appearance of spoilage in any canned good, do not put down the garbage disposal. Instead wrap in heavy plastic, like a heavy duty garbage bag, then in newspaper and discard in such a manner that people or animals will not come into contact with it. Wash up well, yourself and anything that it’s been in contact with. Pick up cans of salmon that are sound, with no dents and store it, as all canned goods should be, in a cool, dark cupboard. Once opened, if not used immediately, remove salmon from the can and store in an airtight container in the fridge and use within 3-4 days. For best quality, if you freeze canned salmon after opening, use before three months. Since canned salmon is already cooked, think of ways to use it that normally depend on cooked salmon. It can be eaten as is for a high protein snack, but most people like to give it a bit of help; it’s a tasty but a bit bland out of the can.Canned Salmon can be used any way canned tuna can be used. It’s good in spreads and dips like My Mom’s Smoky Salmon Spread, chunked in salads, like in the pea salad shown here, which is just peas, a little finely diced onion and a touch of bell pepper over a bed of lettuce. The dressing is an easy Lemon Yogurt Dressing and just “makes” the salad. Canned salmon can come to the table as a salmon salad sandwich or tucked into wraps or in a recipe like this one, originally from Ina Garten for Salmon & Guacamole Sandwiches. Canned salmon shines in Salmon Burgers, just sub in the canned for fresh and don’t put in the food processor. It’s really the thing to use in Not Grandma’s Salmon Loaf. It can be made into Salmon Cakes, just follow the recipe for these Tuna Cakes and use Salmon, instead. You can even turn canned salmon out for breakfast, subbing it in for the fresh Salmon in this recipe for Salmon and Asparagus Hash – just be careful not to mush the salmon up. And of course, there are all kinds of classic recipes for salmon, including casseroles, croquettes, mousse, terrines or a souffle, just to name a few. Many of the producers have websites with ideas and recipes, like this one from The Pure Alaskan Salmon Company or this one from Bumblebee. I know, too, from my cruises around the internet, that I’m not alone in my squeamishness about dealing with canned salmon. Here’s how I roll – and the first thing I do is tell myself this might be a little unpleasant but will be over in a minute or two! Plus, any squeamishness usually evaporates after a few cans are under your belt. Just open the can of salmon and use the lid to press down as you drain any juices. Unlike some canned fish, those juices are fine to use in recipes, maybe to boost the salmon flavor by subbing in for other liquid, or to give to pets. Turn the can over, then lay the salmon gently on its side. A little care makes it so much easier to deal! You’ll see definite lines of demarcation where different portions have been packed together. Just gently touch along the lines with a knife or a fork and it will separate into chunks. Carefully examine the chunks and you’ll usually find any bones are going to be easily visible in a line and can be picked up or scraped off with the edge of your knife and the skin if you’d like to remove it is exposed. Both the skin and the bones, which are very soft, are edible and the bones add calcium; it’s up to you how you’d like to proceed. I’d definitely remove any large bones. According to Consumer Reports, Canned Salmon and Fresh Salmon are very close in nutritional benefits, and canned salmon may contain slightly more Omega-3 fatty acids than fresh. One isn’t necessarily healthier than the other. The nutritional benefits of salmon are so many that it would be possible to only scratch the surface, here. I’m sending you to one of my favorite sites, The World’s Healthiest Foods to read more. Taking a look at the nutritional label of a can of salmon (from My Fitness Pal) gives very little hint at what this powerhouse food has to offer. Keep in mind, the serving size says 2 ounces, while the USDA recommends two 3.5 ounce servings of fish per week. Be sure to check the next section on the “downside” below. And be sure to read the ingredients on any can of salmon so you know what you’re buying and you know if there are any additives and/or colorings. All fish and seafood inherently contain some mercury and there are certain groups who should be especially careful with their consumption, choose fish lower in mercury and limit intake. They include women of childbearing age (about 16-49 years old), pregnant and breastfeeding women, and young children. See the EPA’s site for more information. If you’re interested in Sustainability, you can’t go wrong with visiting and exploring Monterrey Bay Seafood Watch as a first step to learning more. 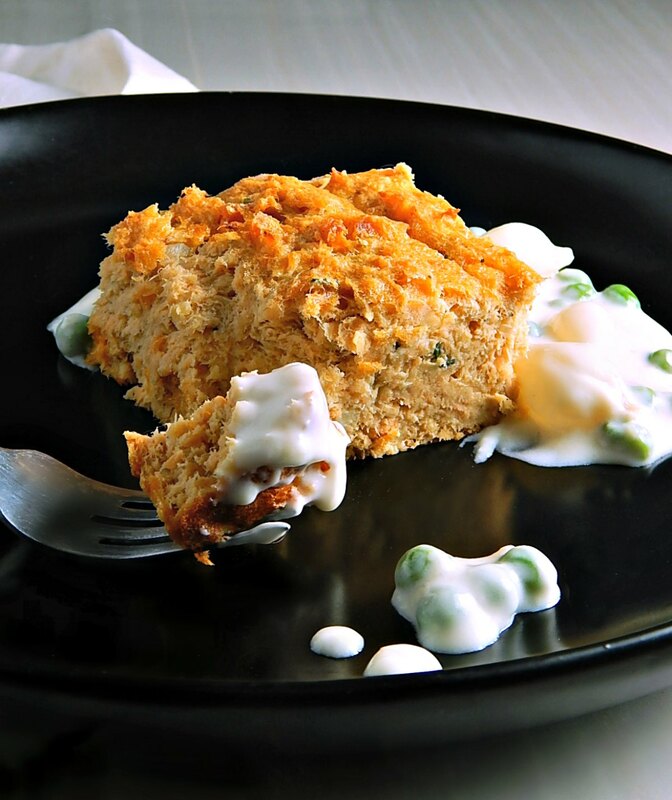 Not Grandma’s Salmon Loaf – this is the recipe that will win you over! I hope you’ve enjoyed “What to do with that Canned Salmon Lurking in the Pantry?” and found some inspiration, here, on how to use this budget-friendly product. I know I’ve only scratched the surface, but additional resources are listed below! This post was updated March of 2019; I’ll be sharing What To Do With That Canned Salmon Lurking In The Pantry? at Fiesta Friday #268. Fiesta Friday is co-hosted this week by Julianna @ Foodie on Board and Angie, herself, who puts on Fiesta Friday! This entry was posted in Click here for Fabulous Food Posts and tagged Canned Salmon, Fish and Seafood, Salmon. Bookmark the permalink. Thanks much!! I had three in my pantry, don’t know why. and that prompted me to make salmon loaf and that prompted me to spiff up this post!! Oh, that’s right, I was caring for the folks and when I came home I took some of the staples home with me! I must have got a male and a female can and they multiplied, lol!! Thanks for being the most gracious host!! I love canned salmon! We get ours from Costco but it doesn’t come with the bones and skin like yours. I usually put it in salads (as an incentive for me to eat more salad) or pasta with fresh veggies, olive oil and a squeeze of lemon! I’ve got to try some of your recipes next time I get them from Costco! Never even thought to put it in a loaf or a sandwich! Yes, pasta! I never thought of that! I’ll have to check out Costco’s salmon…sounds like it would be a little more palatable!! I have found it difficult to find canned salmon recipes beyond salmon patties/burgers. It is a shame because I have found it easy to come by canned salmon that is wild caught and Alaskan. The frozen fillets that I find sometimes come from sources that I would rather not use, so thank you for this recipe list! My pleasure. I always think I should do more with canned salmon, for the same reasons. 🙂 I looked at some frozen shrimp not too long ago and it seemed to be from Japan. I’ve always enjoyed canned salmon (probably because I’m from Kansas and never knew there was anything “better” until I got much older!) I usually use it in salmon loaf, salmon salad (replacing tuna in the standard recipe) and scramble it with eggs. I’m going to have to try your Spring salad though; it looks amazing! I’ve recently started to experiment with canned sardines since they are high in omega-3s and low on the food chain (and cheap!). Alton Brown has an awesome recipe for a sardine-avocado sandwich that eased me into sardines. LOL – I’m from the midwest, too, and if it weren’t for Advent and Lent, we probably would never have eaten fish. I love Salmon loaf, too, but we had some horrible ones growing up. I took my brother’s advice and make it now with oatmeal instead of the standard crackers, and then I always throw a bit of minced bell pepper, onion and celery into it, an egg and a big squeeze of lemon.